Koloale captain, Benjamin Totori, who is expected to bear the bulk of the scoring responsibilities against the Fijian champions, made this call at their training session this afternoon. 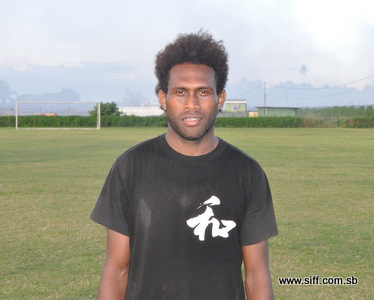 “I believe that the team is playing for the Solomon Islands. I will be doing my best to get the result that we want and hope that the crowd will be out to back us as well,” Totori said. Totori’s comments will sink well with a lot of football fans in Honiara who are looking for some redemption after a forgettable performance by the last Solomon Island club to play in the O-League. Koloale had their third last training session today before their match against Lautoka this weekend with the former Waitakere United striker looking very sharp moving with speed and finishing well. Tonight Koloale will move into camp at the Tandai Hotel Apartment where they will spend 3 nights to prepare for their weekend clash with Lautoka. The experienced Totori said that camp will be important for the players to maintain their focus and strengthen the team’s togetherness. “I think that the pre-match camp is an essential part of our preparations,” Totori said. Totori was also very positive about the preparations of Koloale saying that the team has worked hard after qualifying for the O-League in the Our Telekom National Club Championship. “The result that we want will come by itself if we do everything right come game time,” said Totori. Tomorrow Koloale will be receiving their playing uniform from a yet to be named local company who is backing the national clubs champions in the O-League. Local support for Koloale is strong and the club will be hoping their fans will translate their faith into action by turning up on match day to back them. Koloale also held their first fundraising drive last Saturday to raise funds for their O-League campaign.